“Little Sparks” by Delorentos. Download the song at their homepage. I got a nice note from Kier in the band, tipping me to their music, which seemed familiar to me…. Perhaps from the blogs I read? Or, maybe it was Burtch’s post back in 2008 about the band. Either way, the band are heading out on a North America tour, playing both SXSW and CMW, and I’m inclined to go check them out (at the latter). Why? Well, the music is there plus they do things their own way. For their latest album, they released their first single as a 24-page magazine, their second single with a succession of pop-up record stores and the latest as a radio show. Pretty cool. 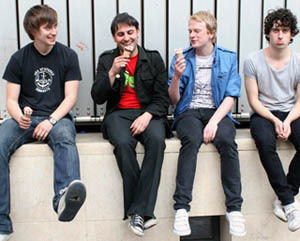 Dublin four piece Delorentos will be featured at the Music From Ireland Brunch at SXSW in Austin next month. They’ve toured with the Futureheads, Tapes ‘n Tapes, and seminal post-punk heroes Gang of Four. 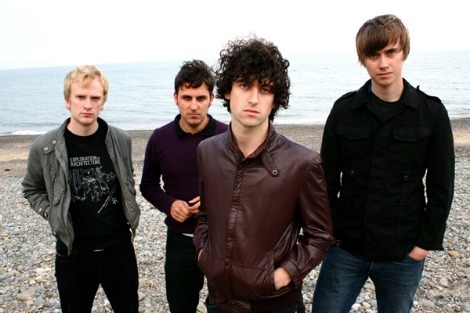 Their infectious brand of indie pop rock has garnered them enough acclaim to warrant a nomination for the Choice Music Prize for best Irish Album (their equivalent to the Canadian Polaris Prize), as well as two Meteor Awards (the Irish equivalent to the Juno or Grammy awards). The tracks Basis of Everything, and Eustace Street both caught my ear.